The flavours of sake may be surprising to those unfamiliar with the drink. Although, apart from one or two, none should be totally unfamiliar: apple, pear, or tropical fruits like banana, melon and lychee are not uncommon. 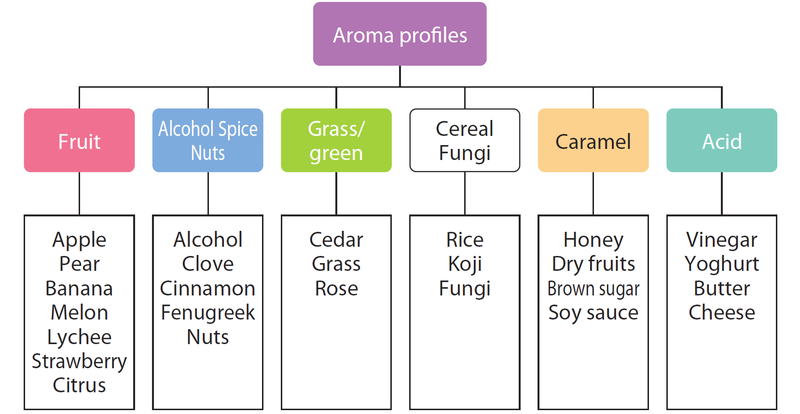 The following diagram – gratefully borrowed from the Japan Sake and Shochu Makers Association – shows the kinds of aromas (and flavours) you may encounter. The list is not exhaustive. More polished sake will tend to have the aromas and flavours listed on the left, whereas less polished will tend to creep further right (although the fruitier notes are not uncommon). See our page on sake types to help understand this.